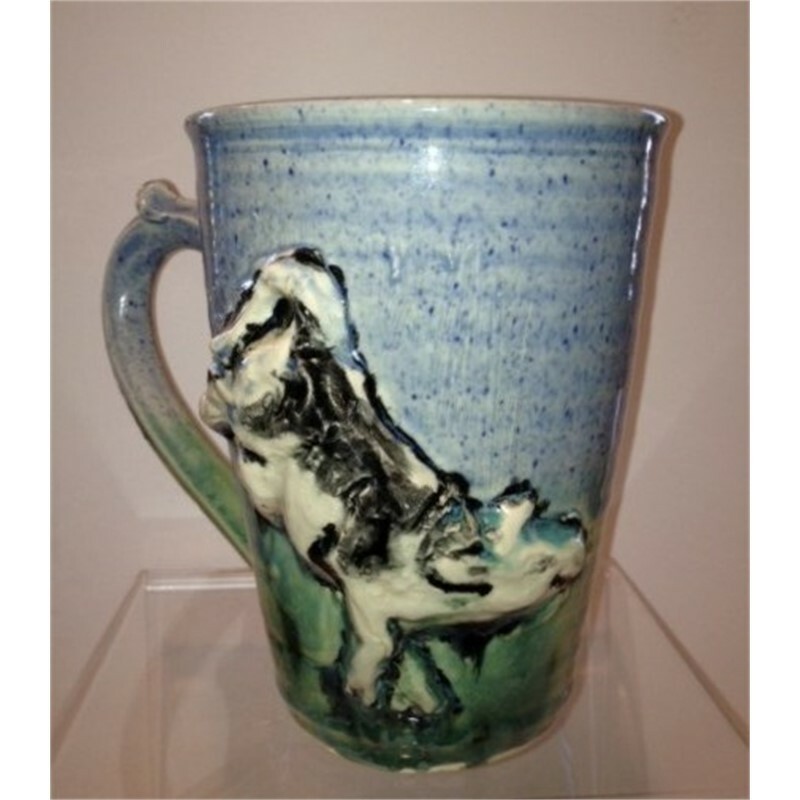 Potter Kate Krause is a former art teacher who now creates beautiful work in her studio full time. 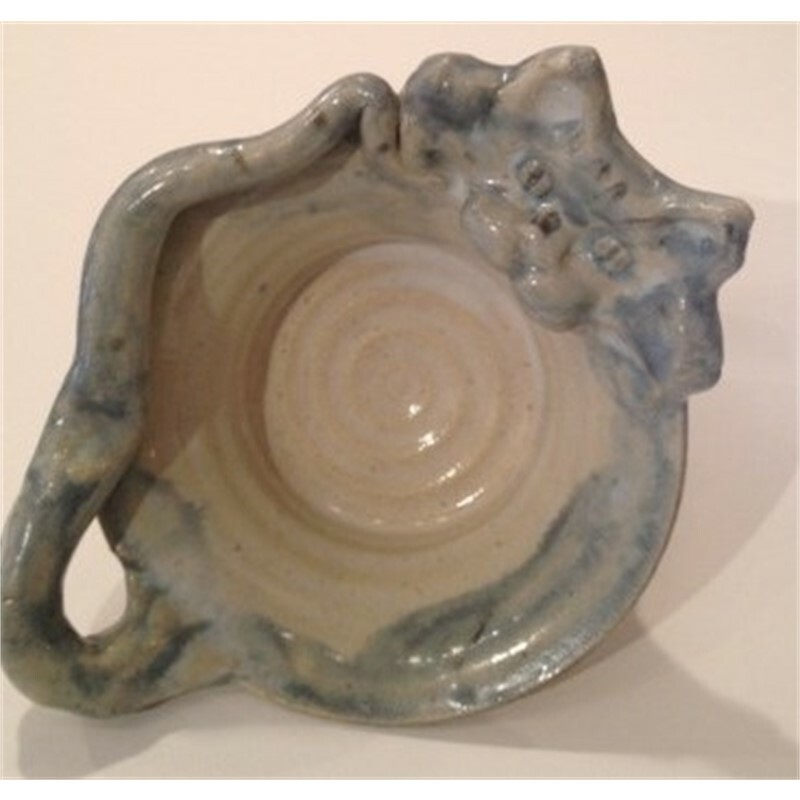 Her whimsical "cat bowls", face mugs and SC mugs are long time gallery favorites. 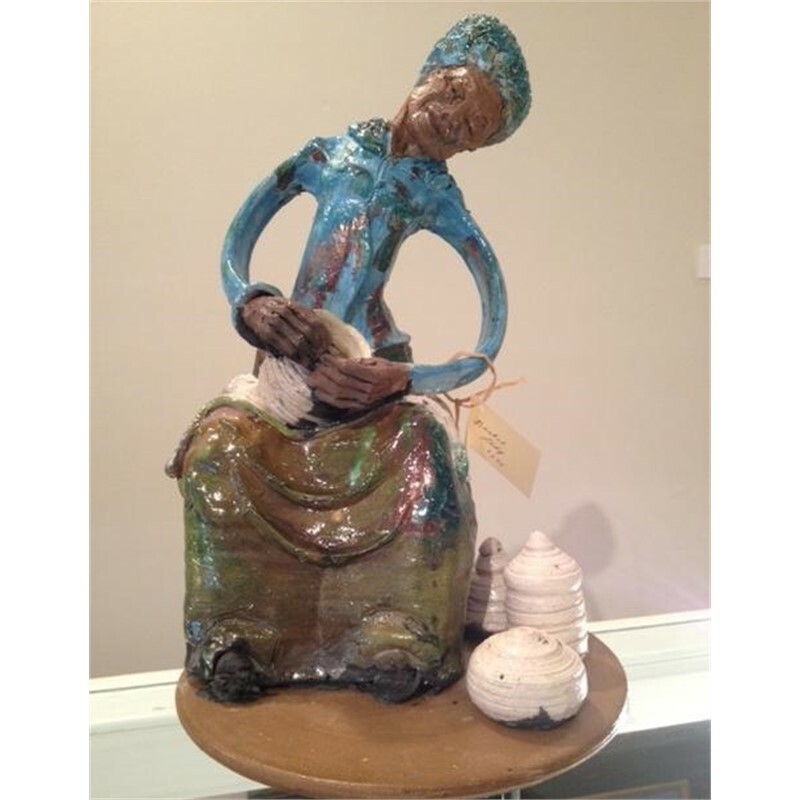 Recently Kate has added unusual Raku pieces to her body of work, including one of a kind pears, owls and sculptures of gullah women. 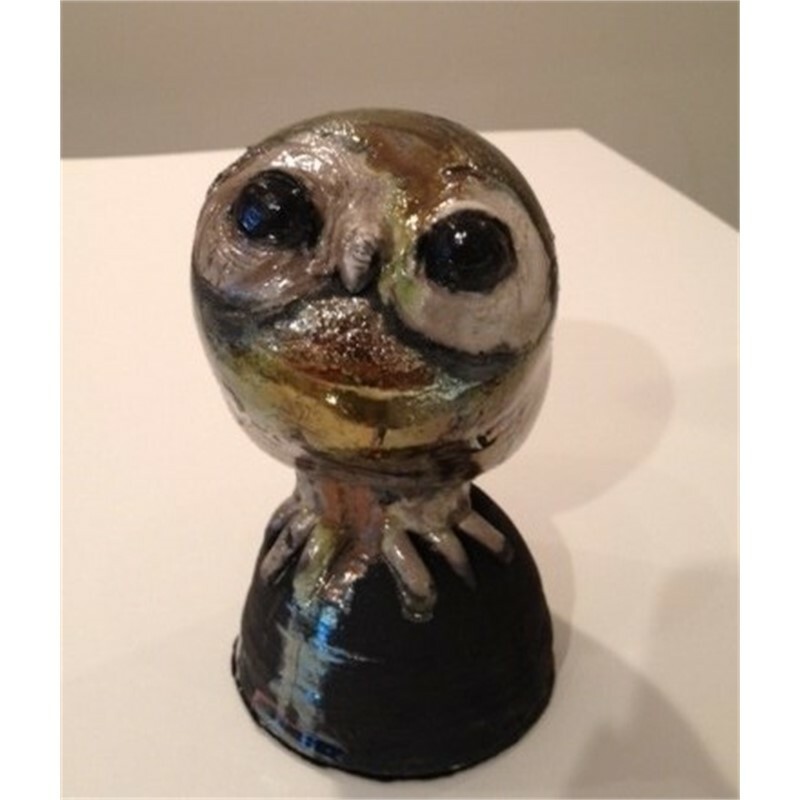 Raku is a multi step process beginning with the creation of the form which is then bisque fired. A glaze is then applied, and fired again. 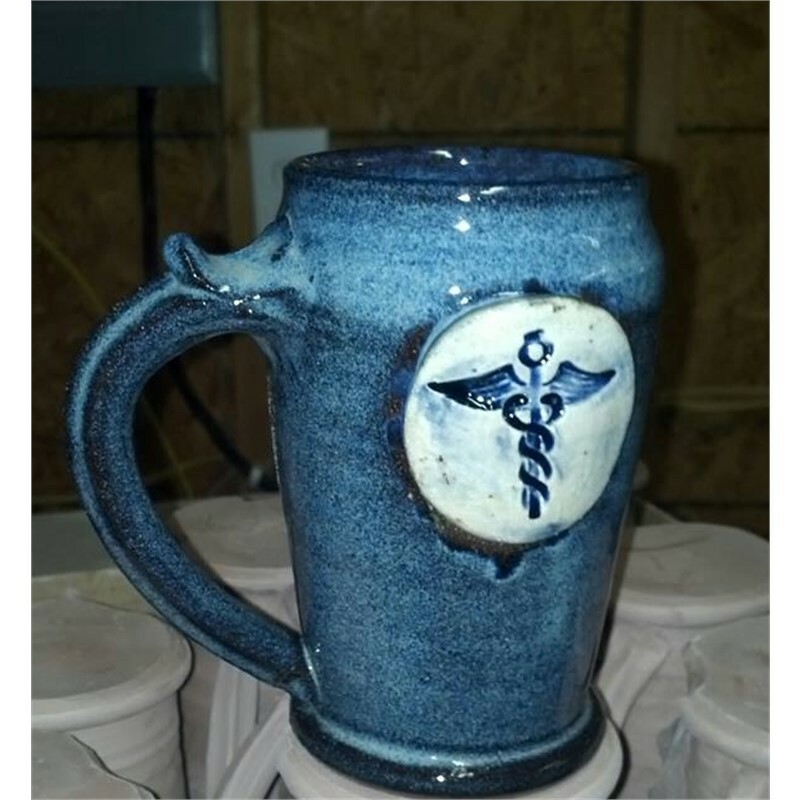 It is removed from the kiln while still hot and placed inside a container of combustible material. The heat of the pottery causes the materials to catch on fire. A lid is placed over the container. 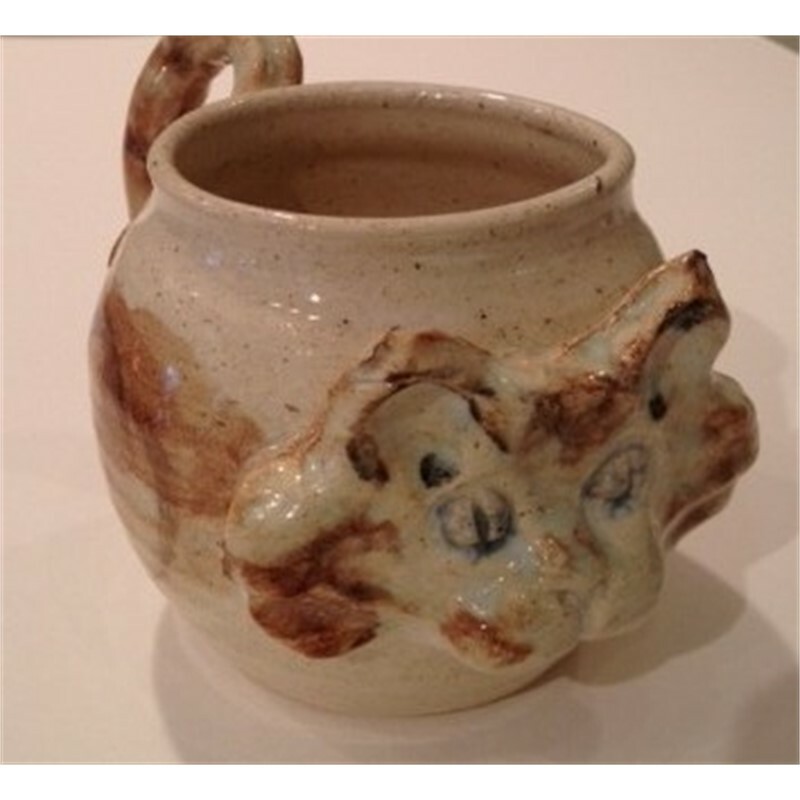 The fire consumes the oxygen within the container, the pottery and the glaze. This is what creates the unpredictable patterns and colors. The piece is then removed and placed in water which will "freeze" the pattern. The cleaning of the pottery after the raku firing is a very time consuming task but a very exciting part of the process as the patterns and colors are revealed. 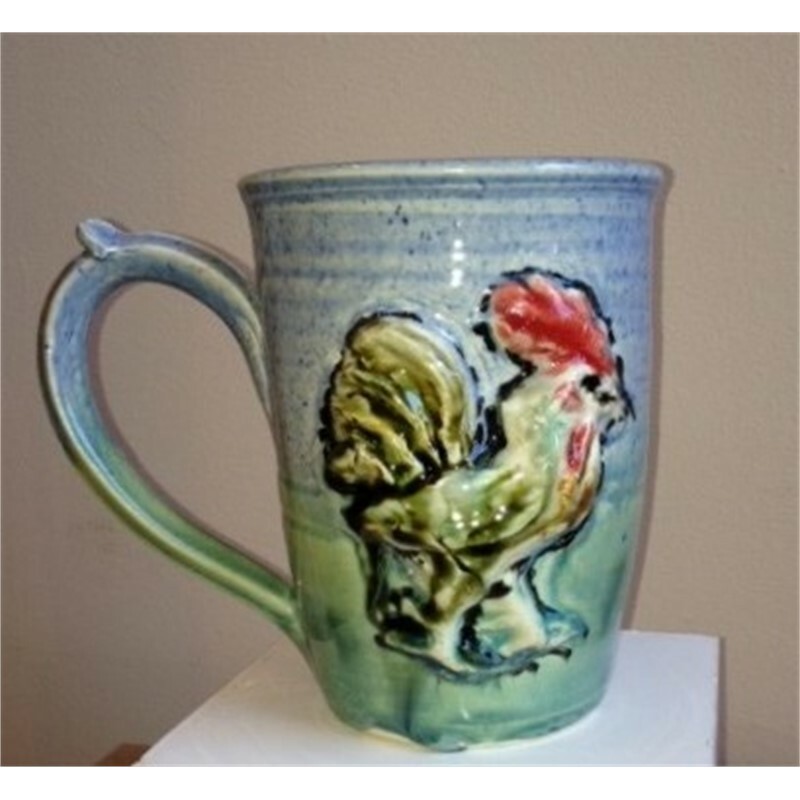 Palmetto Mugs: Share your South Carolina pride with Kate’s handcrafted Palmetto State Coffee Mug. 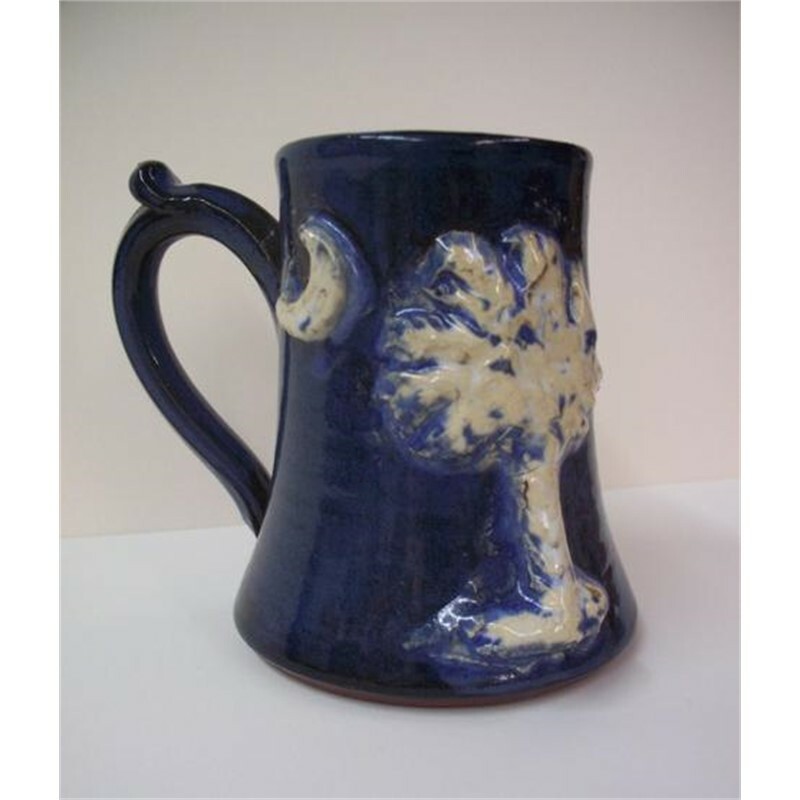 These beautiful handcrafted mugs are glazed in the traditional blue seen on our state flag and are embellished with a hand sculpted palmetto tree and crescent moon in white. The Palmetto, the state tree of SC is rooted in historical significance dating back to the Revolutionary War. On June 28, 1776, the British fleet's attack on Sullivan's Island was repulsed in part because of the the palmetto-log fort, under Colonel William Moultrie. When the British warships fired cannonballs, they sunk into the soft wood instead of shattering and destroying the fort. Patrick H. Grills, a professor at Furman University, said; “Kate Krause’s work shows great skill, great humor and insight into the creative process. 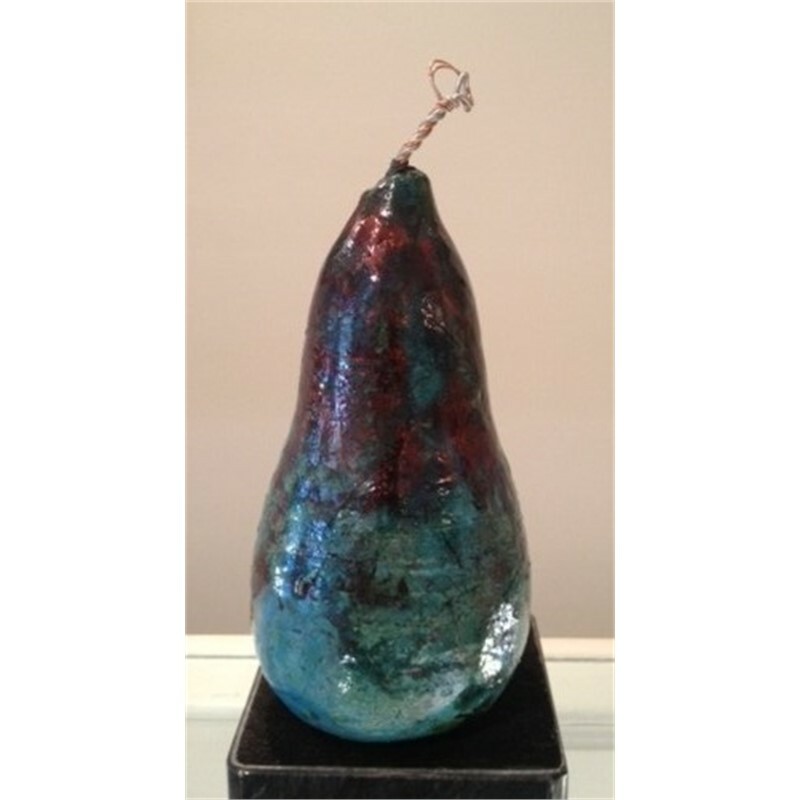 Tereasa Ray, a journalist with Greenville SC’s Metro Beat says; “Kate Krause’s work is artfully fun.” We agree!